It's the station of the "catching" type, as the small stations. The difference consits in the number of the station's lines. All the algorithms, used with the small stations are used with medium stations just the same way. 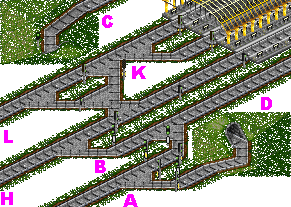 As in the case with small stations, train comes to the in-line-block C (D), then to the depot E (F), and then to the station. When the nearest to depot platform is in use, the train does not go to the depot G, as it were with small stations, but the mentioned train checks the platform in the middle of the station and uses it, if it's free. 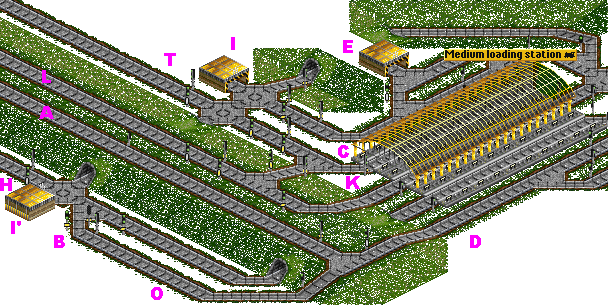 If it's in use, train goes to depot G. From the depot G in the middle it can go to any of the free platforms. In case of loading station (schema 2.1), it can use "Reverser" J just the same way as it were with small loading stations (schema 1.2). But it's more interesting to examine for connecting medium stations to different way types. First of all, the most simple variant is to connect it to two-line way (schema 2.2). In this case it's being made just the same way as happens with small stations. The only difference (see schemas 1.1 and 1.2) consists in the following: the middle platform line-out is connected to the one of branch out-lines. In this case, if priority routing (schema 6.6) is used, the way, witch the middle platform out-line connected to, must have a priority direction from the station (not to the station). But the medium station can be also connected to two two-line ways (schema 2.3). If the number of the trains does not reach the limit on both the two-line ways, it will cope with the traffic. But if there are sufficiently big amount of trains, traffic jams will appear. Then it's better to use large stations. So, let's investigate, how does it work. Trains can come from both directions, from A and from M. That's why line-blocks C and D would have problems providing unchecked advance of trains. Additional buffers are required. That's why there four buffers P and R (before C) and O and Q (before D) are build. One buffer per possible in-line. In this case, line-changers B and N play an additional role as the buffer selector. Two depots I and S function as situation controllers. The branch out-lines are connected directly to one the two-line ways and the central out-line is connected to another way through the buffer L that doesn't allow all the out-lines to be blocked by a single breakdown. The system can be expanded with one more line-block creation, connecting line-changers B and N with the out-line buffer L.
Another ability with medium stations consist in connecting it to the three-line way (schema 2.4). In this case it works like a small station (schema 1.5). The differences are the following: out-line changer K, that directs trains from three platforms to one main and one auxiliary line, and most capacity of the way. 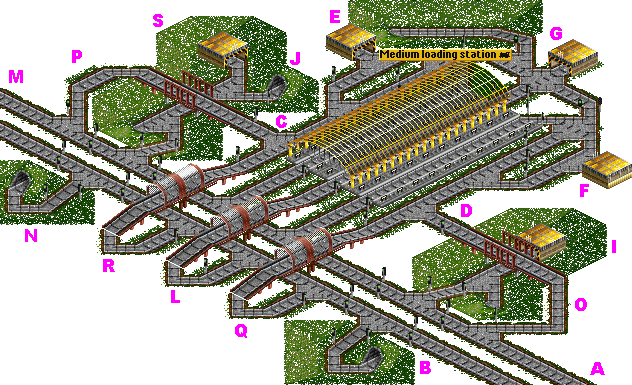 Medium stations can be also used with four-line ways, if the number of trains is not higher, than the station is able to supply (schema 2.5). In contrary to the case of connecting to three-line way, in which trains from the main in-line A could use both the in-line-blocks C and D, while here they can use only one line-block D. That's made because there are two auxiliary lines H and T, and it's provides more abilities for trains, coming from them, to enter the in-line. For example, an additional buffer O made for them before in-line D. A system of two pre-signals controls the situation on line-changer B in such a way, that trains are able to go to the line-block C or to the buffer O or wait in depot I (or I'). The out-lines system is a less powerful, than the in-line one. It allows trains to leave the station only if one line out is free. Two branch lines from the station are connected to lines-out H and T, and the central line is connected to the main out-line L. A "Reverser" J can be used without problems. The system can be expanded with one more line-changer K on the way-out. 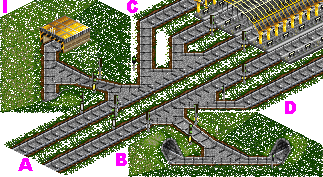 It increases trains goeing out ability, allowing to change the line between L and T(H) between trains, going from the left and the central platforms. But with a risk of blocking ALL the three lines-out by single breakdown at worst. In the similar way there can be made a line-changer before B between A and H with the same type RISK. But this worst situation case appears to be worse. In case of blocking lines-out on K, trains would ply between depots (E, F and G). In case of blocking lines-in trains will run along the four-line way with abrupt results. 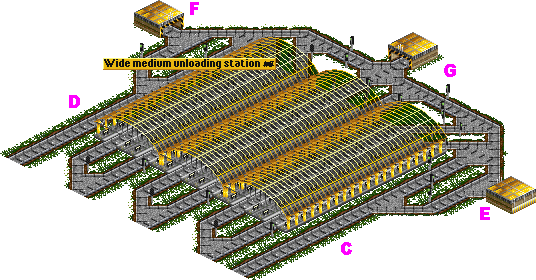 Medium stations can be built in some other way. If there is no space near the station on the one side (because of land objects or competitors), it's possible to build the station as it represented on the schema 2.6. The only problem consists in "Reverser", because it's difficult to find place for it near the G depot. Wide variant is also possible. Alternative variant for wide medium station is build the same way, as in case of small station.